Clean and wash catfish good. Most will call for a gallon of water and a cup of salt. But as the fish are not going to be held for a month. I cut my salt back. After getting the brine ready. pour it in a plastic container. And add fish. Let them soak for around 8 hours. Take fish out of the brine. And dry with paper towels. And then allow to air dry they will get a light glaze on them. I have a big half circle needle, And with cotton twine. I place the twine in the collar bone of the catfish. Allow about a 3" loop above the fish. Then I use Hardwood dowel rods that are 1/4" thick. Mine are cut 17 3/4" long. 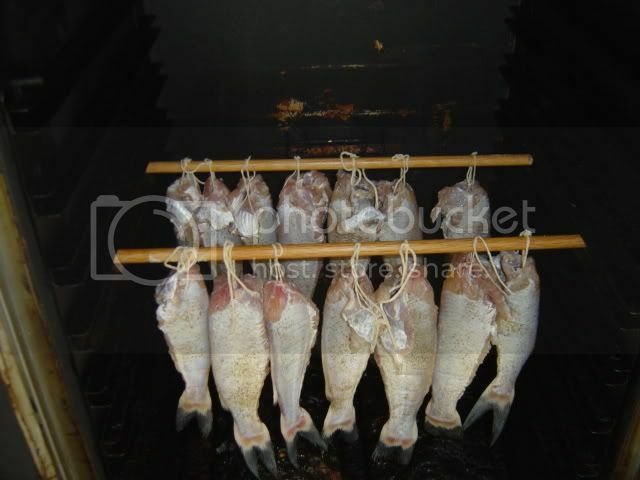 Place the fish on the rod and hang them in the smoker. I smoke them at 235 and it take me around 3 hours for the 3/4 lb or better fish. I take mine out when they have that golden brown color to them. No smoke as the smoker gives them all the flavor they need. Hope you enjoy them. Each time I smoke a batch, There gone in a heart beat. Last edited by smokin-tnpete; 10-08-2017 at 08:48 AM. Do you normally eat the catfish plain or with other preps? Doc not sure how I have overlooked your post this long. But at times we only eat the smoked fish. Other times I will fix Hushpuppys and fries with them. Or flake the meat off. And mix it up making smoked Fish Tacos.